July brings Independence Day, a time for celebrating freedom. With this July is-sue, Scientific American shakes off the constraints of its past design and embraces more of the opportunities of publishing in the digital age. The topflight content of Scientific American is unchanged: our feature articles continue to be written by leading scientific authorities and journalists and illustrated by the finest artists. The layouts and figures, however, are more modern and approachable. Busy readers will also appreciate the introductions from the editors that highlight the major points of the feature articles. And for readers whose appetites are only whetted by the articles, notes throughout the issue point to related content online at www.sciam.com that can further their explorations. At your suggestion, we have taken our scientificamerican Perspectives editorial, bundled it with the voices of our regular columnists and added a Forum for guest essayists to create a consolidated Opinion section. We have also brought to print our popular online Fact or Fiction? column and installed it on the last page. A widespread weakness of science journalism, in my own opinion, has historically been a lack of follow-up. News media routinely tout recent discoveries or announcements of promising inventions, then move on to the next breakthrough du jour, with nary a backward glance. Years go by, and the increasingly jaded public is left muttering, “Where's my flying car?” To at least a small degree, our new Updates page addresses that lapse: it looks back at the science in past headlines and reports on what did (or did not) come of it. Turning back to the magazine in your hands, you will find a set of feature articles that are by turn informative, imaginative and provocative. 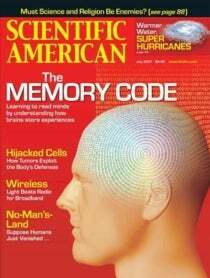 Take our cover story by neurobiologist Joe Z. Tsien on “The Memory Code” (page 52). Tsien and his co-workers have begun to tease out of the brain a code for understanding how neurological activity corresponds to specific thoughts and memories. Some of the theoretical fruits of these studies—such as computers that can read human thoughts in detail—are far off in the future, if ever, but the fact that researchers today can even speak meaningfully about pursuing such goals is breathtaking. A more pressing concern is climate change and how it contributes to the severity of cyclones, as Kevin E. Trenberth explains in “Warmer Oceans, Stronger Hurricanes” (page 44). Unlike rising sea levels that may become critical decades from now, intensifying storms already seem to be a problem. The 2007 hurricane season, unlike that of 2006, will most likely be a tough one—which, as Mark Fischetti reports in our News Scan section (page 21), is unwelcome news in New Orleans, where post-Katrina repairs to the levee system may not be enough to protect the city. Author Alan Weisman, who discusses his new book in “An Earth without People” (page 76), is not specific about what calamity might eliminate the human race, but that is beside the point. Rather he argues that imagining a world without Homo sapiens illuminates how the footprint of our species on the environment can be at once transient and eternal. Finally, in the dialogue “Should Science Speak to Faith?” (page 88), scientists Lawrence M. Krauss and Richard Dawkins debate whether science and religion are or must be antagonistic. Their views will surely ignite discussions among readers—but then, it wouldn't be July without fireworks.